Kids dig beach holidays. 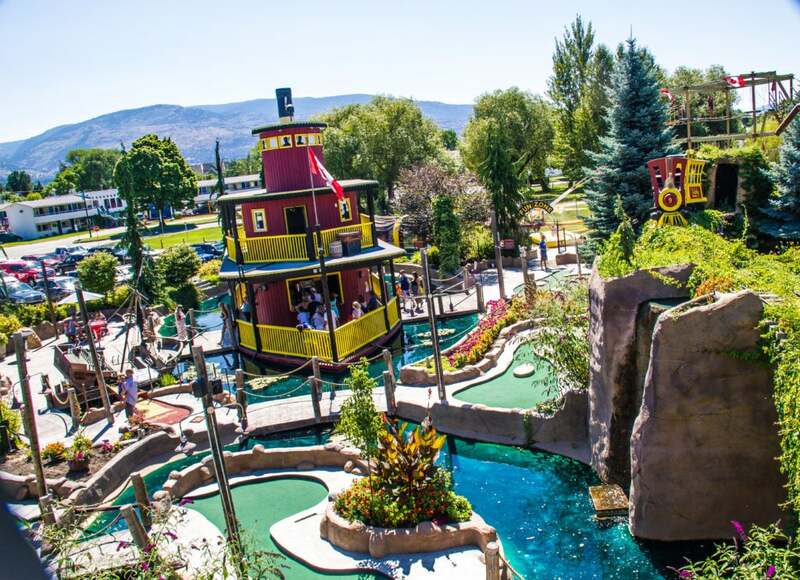 Cue Penticton, with its sandy shores, seemingly endless sunshine, and a thriving business centre with plenty of activities to keep the little ones entertained for days. Chatelaine magazine just named Skaha Beach as one of the top 20 beaches in Canada. 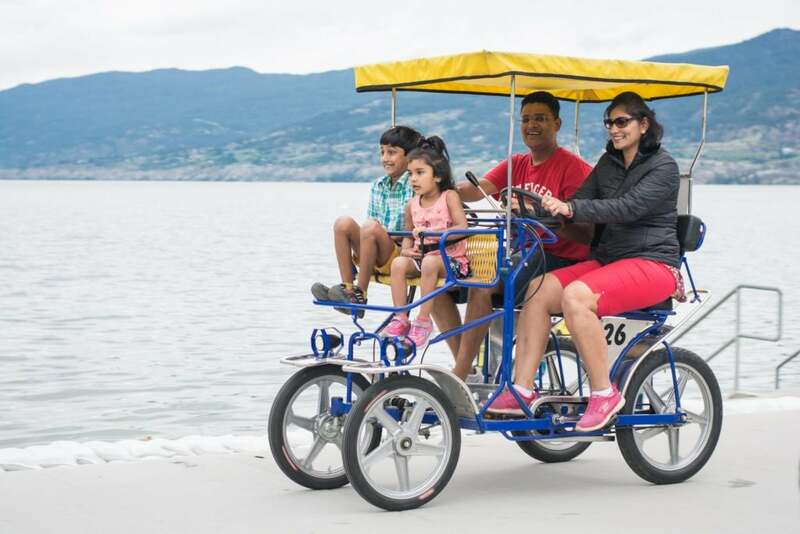 Penticton was also recently selected as among the top places to visit in the country, according to an Expedia survey. If that’s not enough to pack your bags, here are 10 more reasons to take the kids to Penticton this summer. Just wait until your kids set sight on LocoLanding Adventure Park, where you can spend hours playing mini golf, riding the go carts, exploring the ropes course, or ramming each other in the bumper boats. Or head indoors to Hoodoo Adventures Indoor Climbing Wall to scale their 4.5-metre (15-foot) bouldering walls, with options for all skill levels. Then take those skills outside for some outdoor rock climbing at Skaha Bluffs. When in Penticton, it’s a summer rite of passage to float the channel between Okanagan and Skaha lakes. Kick back for 7 km of relaxing floating and sunshine. If you didn’t pack rafts or tubes, you can purchase some from Penticton Bike Rentals or rent from Coyote Cruises, which provides a shuttle to bring you back to the start. 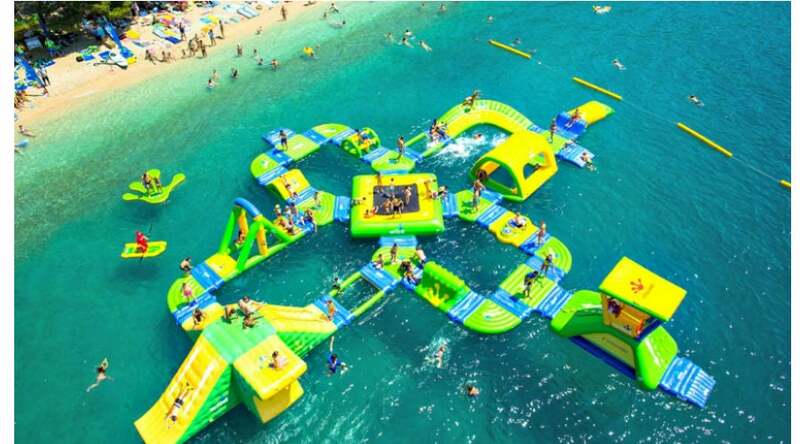 Sunny days also call for splashing around in the lake, and kids age five and over will definitely want to jump around on the Wibit water park set up on Okanagan Lake. Try stand up paddle boarding at Glow SUP Adventures or Naramata’s Sun N Sup. Boats and jet skis are also available for rent throughout Penticton. Bike riding is one of the greatest kid pleasures. If there’s one route you definitely want to explore, it’s the Kettle Valley Railway (KVR) Trail. Once a railroad, the decommissioned tracks are now an easy-riding gravel trail with incredible views of lakes and vineyards. You’ll find family bikes and mountain bikes available to rent from Penticton Bike Rentals, Hoodoo Adventures and Freedom Bike Shop. If you want to buy or service your bike, try the Bike Barn. Another fun place to ride is the Penticton Pump Track, featuring rollers and banked turns for honing your skills. It’s located near the parking lot on the KVR Trail at 1194 Poplar Grove Road. Another Penticton specialty is People’s Craft Soda, which is the only soda tasting room in Western Canada. Kids can line up at the bar to taste pop made with natural ingredients. In the mood for ice cream? 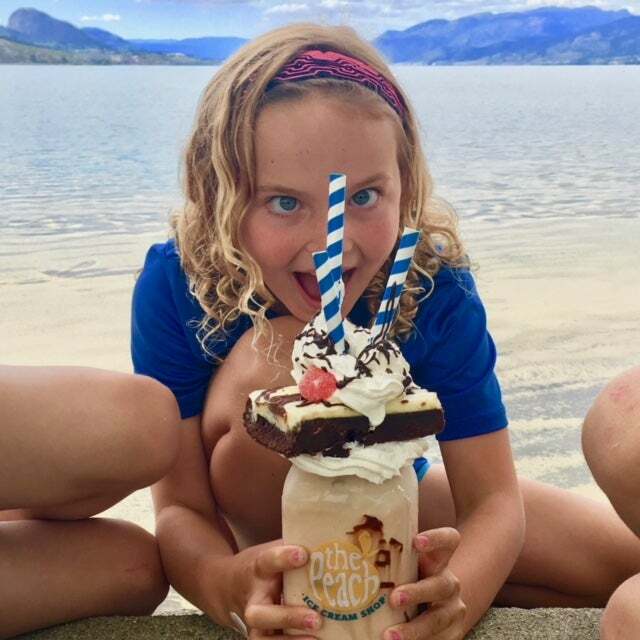 The Crazy Shakes at The Peach on Okanagan Lake will soothe any sweet tooth. Other local favourites include Ogos Ice Cream, Tickleberrys (From Skaha Beach concession or at their Okanagan Falls location), Patio Burger’s homemade ice cream, and VeriBerry Frozen Yogurt. Hungry? Saturday mornings are the time for hitting the markets. The Penticton Farmers’ Market was rated the #2 thing to do in Penticton by TripAdvisor reviewers (after Skaha Lake Park). Also, stroll through the Downtown Community Market, packed with hundreds of vendors . Take a walk through downtown Penticton to peruse the local retailers, including The Book Shop on Main Street, which is one of Canada’s largest used book stores. Another fun spot for kids is Sirius Science and Nature toy store, and you’ll also find some retail fav’s at Cherry Lane Shopping Mall. Also, when in the Okanagan, be sure to visit a u-pick or fruit stand. Slide, jump and play – indoors! 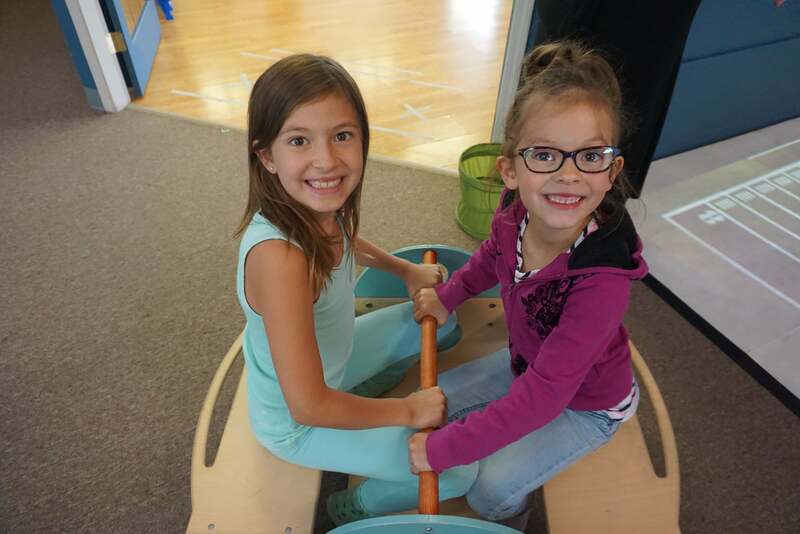 At Time Flies indoor playground, kids age 10 and under can climb the wood play structure, slide the tube slide and jump on the bouncy house. Got active kids? FitKidz Gymnastics offers drop-in classes for parents and tots. The Okanagan Hockey School also offers hugely popular summer camps for your future hockey stars. Penticton also has a wonderful community pool and rec centre, with a children’s leisure pool and lazy river, waterslide and spray features. Other local indoor highlights include Roll N Stones bowling lanes, the Penticton Museum and several art galleries (pick up a studio tour map from the Penticton Visitor Centre). Beat the clocks and locks in a thrilling live game experience at the new Desmios Escape Rooms. You’ll find plenty of fun foodie options in Penticton, from Stix Bao and Bubble Tea to Burger 55 (with a special kid menu on the small clipboards). Others to try are Pasta Factory, Patio Burger, Smugglers Smokehouse, Salty’s Beach House, and The Nest & Nectar. Many of the breweries and wineries offer food and are kid-friendly, and you’ll also find all the major favourite chain restaurants. 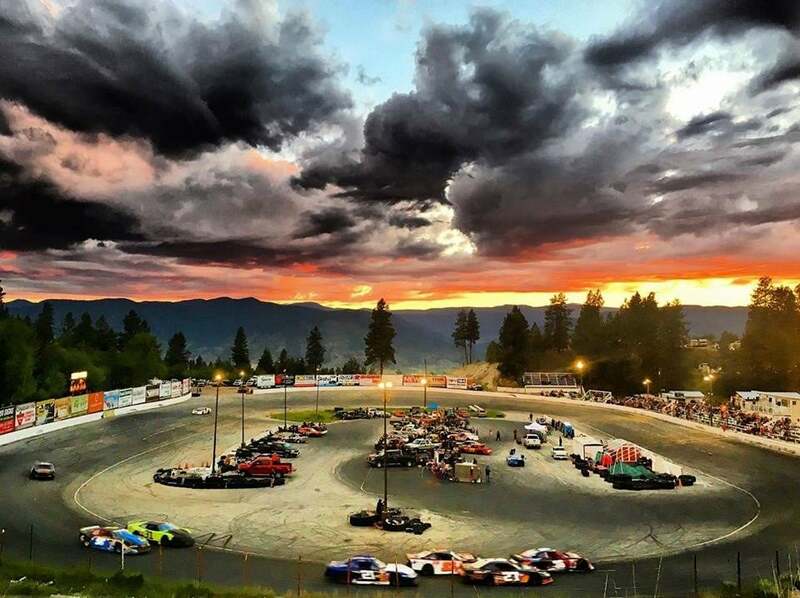 Get your pulse pumping at Penticton Speedway. From racing to bull riding, the entertainment at this oval track is never dull. Another unique experience is a visit to the S.S. Sicamous, deemed to be Canada’s largest surviving stern wheeler. It sits at the far end of Okanagan Lake and is available for touring, featuring a model KVR train. Have you ever seen a group bike that can carry up to 15 people? Smile Cycle Tours offers a fun, family-friendly guided tour through the downtown cultural district that involves everyone riding on one Dutch-made community bike. And that’s not all. Families with kids age six and up can get their thrills at the Penticton Virtual Reality Studio at The Cannery Trade Centre, where you can play virtual reality games. Some of the best childhood memories are made on family camping trips. Whether it’s biking or campfires or simply digging with sticks, any thoughts of TVs and math homework are long forgotten. 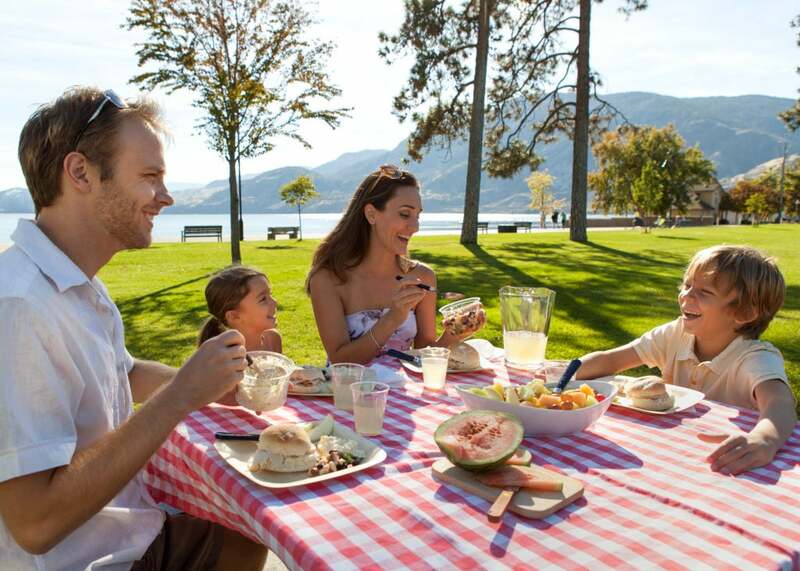 You’ll find numerous campgrounds throughout Penticton – including Barefoot Beach Resort, Holiday Hills RV Resort, Lake Skaha Tent & Trailer Park, Oxbow RV Resort, South Beach Gardens Campground & RV Resort, Wrights Beach Camp RV Park – as well as two in nearby Kaleden: Banbury Green RV & Camping Resort and Camp-Along Resort. Did we mention that Penticton has seven public beaches stretching 5 km along two lakes? Sand castle heaven! Also be sure to pay a visit to Discovery Park natural playground at Skaha Lake, which has boulders for climbing, logs for balancing, swings and an interactive water feature. Kids can cool off in the Rotary Playworld splash pad nearby. Skaters, scooters and bikers will love the youth skateboard and BMX park on Riverside Drive beside LocoLanding. 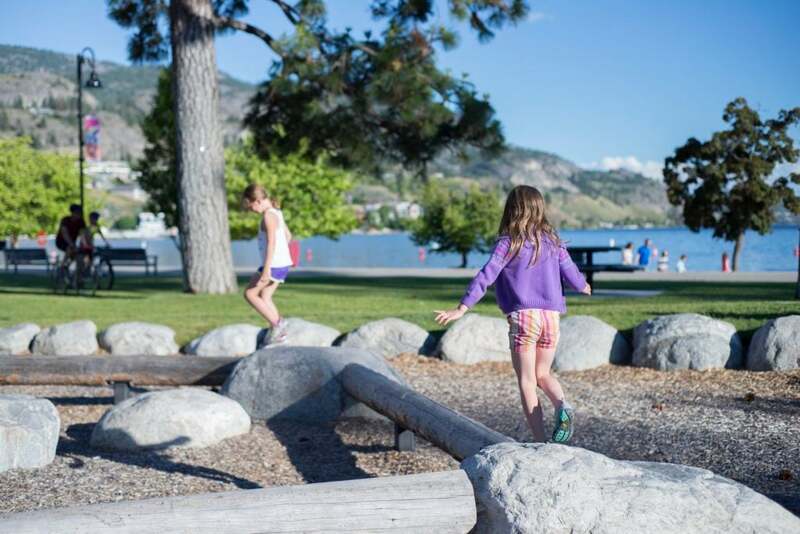 For a list of other great parks, splash pads and adventure playgrounds, visit the City of Penticton’s website. TripAdvisor Canada ranks Munson Mountain as the #2 park in Penticton (after Skaha Lake). Famous for its giant PENTICTON sign, you can climb to the top for panoramic views. Another great activity as well, is to go up to Summerland to take a historical steamtrain ride on the Kettle Valley Steam Railway. Great suggestion! We love the Kettle Valley Steam Railway. Have you tried the great train robbery?